Rex Art Supplies Launches Fredrix Pro Series Stretched Canvases | Save 10% Extra! Rex Art Supplies Launches Fredrix Pro Series Canvases | Save 10% Extra! Fredrix has long been the number one manufacturer and producer of canvas for artists in the United States. Not a company to rest on their laurels they have introduced the Fredrix Pro Series of stretched canvases, one of the finest, and most anticipated products in their storied history. The Fredrix Pro Series Stretched Canvases are not designed for every artist or every artistic application, but when a top quality substrate is required they more than fit the bill. 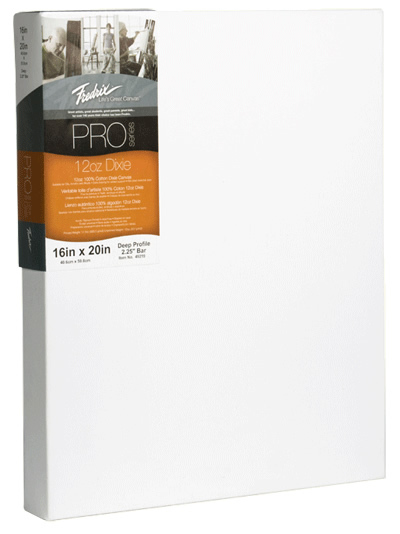 Simply put, the Fredrix Pro Series Stretched Canvases are the finest stretched canvas series ever produced by Fredrix. In addition they are available in a large number of different sizes, and constructed with either a 7/8″ Profile Bar, 1-3/8″ Profile Bar, or an ultra contemporary 2-1/4″ Profile Stretcher Bar. This series of canvases are fantastic! It is very well constructed and feels very sturdy overall. The surface is tightly stretched and flat. I kept running my hands over the surface to feel its niceness. I have painted a large portrait (72″ x 60″) with Golden acrylic paints. The result is very satisfactory! I am very sure painting landscape or abstract will be marvelous also. Compared with some custom-made large canvases I used, this one is absolutely at the top. I wish Fredrix could make 84″ x 60″ also! Everything has pros and cons. Since it has a lot of teeth on the surface and its large size, it eats brush fast also (due to the law of physics). I can see some brush hair remains on the surface. Portrait painters might wish a smoother surface. You cannot have it all. I think it suits palette knife painting the best (but it will eat knife fast also). This is not a complaint though. I am so happy that Fredrix took this big step to introduce us this high quality new Pro series. I truly appreciate your outstanding customer service. I definitely will order more later. You know at Rex Art we are always about giving outstanding customer service, great products, and great prices. Right now would be a great time to try out the new Fredrix Pro Series Stretched Canvases because we are offering them at an additional 10% OFF from now through 11/30/10. Just click the link below to add the coupon to your cart or enter the coupon code at checkout. Take an Extra 10% OFF Fredrix Pro Series Stretched Canvases from Rex Art! We would love to hear your thoughts on the new Pro Series Canvases from Fredrix. Please post a review on our site, or reply to this blog post.